Bronté Barbé (The Little Match Girl), Declan Bennett (Brendan), Danielle Kassaraté (Narrator) and Kate Robson-Stuart (Ensemble) (c) Tom Grace. 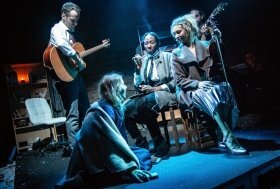 Inspired by Hans Christian Anderson’s The Little Match Girl, the acclaimed Off-Broadway musical Striking 12 is playing for a strictly limited run at The Union Theatre, London. This interesting musical has a varied score which reflects a diverse range of musical styles including folk, pop and jazz. The cast do an amazing job as they integrate playing a variety of instruments whilst at the same time acting many characters in this original little musical. Striking 12 tells the story of Brendan, fed up and alone on New Year’s Eve, he starts to read The Little Match Girl after a chance encounter with a lightbulb seller. The clever storytelling in the show brings both stories to life simultaneously resulting in a clever, charming tale. As always with productions at The Union Theatre, every effort has been made to set the scene and the usual ticket coupons being replaced by matchboxes is a lovely extra touch. The stage itself is fairly empty, consisting only of an armchair and a few moveable bookcases but in this case, it works really well to allow the audience to focus on the clever storytelling. Danielle Kassaraté is fantastic as the narrator for the show, adding humour where needed. In fact, the three ensemble cast members work together brilliantly to ‘tell’ the story as well as act it. Leon Scott’s drum playing and comic timing are both great and help drive the show forward and Kate Robson-Stuart’s ability to switch between characters and play the most gorgeous violin pieces must be commended. Declan Bennett, well known for his roles in Once and Jesus Christ Superstar, is brilliant as downcast Brendan. His song ‘Fine, Fine, Fine’ is a particular highlight and his general unwillingness to celebrate yet another New Year is one that many will be able to sympathise with. Unusually for this venue, microphones are used during this production and whilst it helps to be able to hear the vocals, it unfortunately means that in some cases Declan’s guitar playing was inaudible. Bronté Barbé (Beautiful, Shrek, The Wild Party) is able to convincingly play two opposite characters. The bubbly quick-paced lightbulb seller and the downtrodden-yet-hopeful Little Match Girl. Her song ‘Matches For Sale’ is delightful and the clever direction by Oliver Kaderbhai helps to enhance the song further. The innovative use of candles and matches throughout the show which were timed to perfection further adds to the atmosphere. Overall, Striking 12 is something quite unique. A mixture of stories, music styles, moods and atmospheres. Whilst it may lose its way slightly in the middle, the ending is charming and some of the songs especially ‘Picture This/Caution To The Wind’ and ‘It’s Not All Right’ are wonderful. For something different then definitely try to catch this charming musical over this festive period. It’s New Year’s Eve and Brendan is done. His fiancée has left him, he’s going to lose his job and his boss is making him work late. The last thing he wants to do is celebrate. A chance encounter with a lightbulb seller changes everything.